What a beautiful blue that dress is, it works so well with your sash and shoes. Gorgeous post. I've only recently started my blog, do come see me in some vintage Biba. Singing in the Rain is one of the all-time greats. Makes me want to tap dance. You're wearing one of my other all-time favourites - blue/red combo. It's such a vibrant combination. Believe it or not, I've never seen the film. Now I know that I must!! I'm glad to know the stage adaptation was also enjoyable. I love dance as an art form. It's not at all in my skill set, so maybe I appreciate it that much more! Your lovely, moody photos are a delight. I love the nod to another era. I love the outfit, the blue, grey and coral are great together. Stunning pictures! I am still new to your blog but like it very much already. I am reminded of 50 years ago when I went with a boyfriend to see the film of West Side Story. It was so exciting, so new. We came out of the cinema to the night lights of the centre of Liverpool and danced our way back to the bus stop. Good memories still there after 50 years. Again a lovely piece of writing Ros. I've never seen the film either despite the promo poster being a standard fixture on every student's wall back in the 1980s. One of my favorite films! Lovely photos! Oh I love singing in the rain, I used to watch it with my Nan over and over again before she passed. I love the colours in your outfit, unexpected but they work so well. These are such stunning photos and I love the bright colors in the natural and dark setting. Gorgeous! The vintage umbrella is pretty awesome too. Great homage to a classic musical! And my collection of vintage umbrellas are now clamouring for an outting. Looking rad as usual, Roz. I'm catching up on your blog while watching the presidential returns come in (GO OBAMA!). This lovely little essay took my mind off the race. I loved this line in particular: They draw the audience in, each extended limb or curled hand like a comma beckoning our full attention. lovely photographs.The last one is especially brilliant. This is such a lovely blogpost. I'm so in love with these photographs - Singing in the Rain sounds like such a fun, energetic film to watch and you're so lucky to have been able to view it in the theatre as well. Thanks for sharing all these photographs with us. Your outfit is stunning! Anyway, you inspire me so much. I'm in awe of your amazing style of writing and how naturally words seem to come to you. I'm an aspiring fashion journalist just 2 years younger than you and I'm impressed by all your achievements and how talented you are at writing. I'm a new follower of your blog and will definitely be coming back for more. Have liked you on Facebook and followed you on Twitter as well . Have an amazing day, love! I love that musical. My housemate used to sing Good Mornin' all the time. Professionals always make the most difficult things seem easy - I guess it's that way with this movie too. I never knew the background stories. And how exhilarating that the stage production "rained"! You have done a beautiful photo homage to this musical. I especially love the dreamy quality of the last photo. Who is she? Where is she going? Is she flying? I love your pictures, they are brilliant and so beautiful. What a wonderful experience that must have been! I was very relieved to read that all that water was recycled. Dance is such an extraordinary thing, and it really is amazing to watch the way the human body can move. I'm so envious of all the backdrops you have for the photos on your blog - and of course, the clothes! It's ages since I watched Singin' in the Rain... (I remember being so impressed when I learned he was actually running a high fever when they shot the scene)... and I very much agree - rain, especially warm, summery one, feels wonderful. On a different note - your photos are very beautiful. Love the tones and colours. I really love those pics! The first one is awesome! It has been a while since last I visited your blog. I am glad I found the time to lurk here today. Your photos and words have inspired me once again! Beautiful photos, that last one with the reflection in the water is stunning. 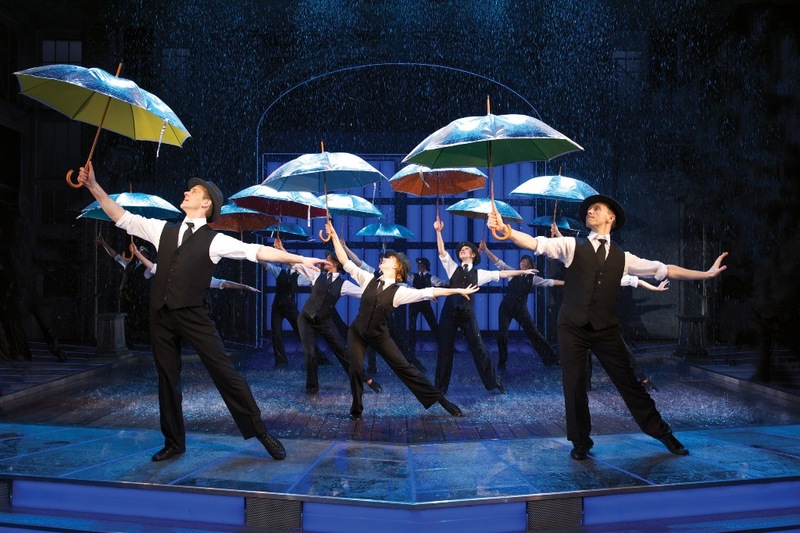 I loved Singing in the Rain, such a brilliant musical, it's impossible not to have fun! I love how you started: no rain but a vintage umbrella. hahaha You look adorable as usual.